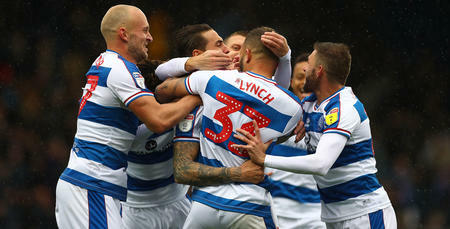 CARETAKER manager John Eustace was left cursing his luck as he returned to his old stomping ground, seeing QPR lose to two injury-time goals against play-off chasing Derby County. Clear-cut chances were at a premium for both sides throughout the game, with Mason Mount’s second-half effort which was tipped onto the post by Joe Lumley the best opportunity prior to the late, late drama that unfolded. As the clock ticked over to the 93rd minute, the ball was played into the patch of Jayden Bogle in the Rangers box and Freeman seemed to get in front of the Derby man and nick the ball away for a corner. But in the eyes of referee David Webb it was a foul and a subsequent penalty. Harry Wilson converted and in the dying moments of the game grabbed his second when Rangers had committed men forward in search of a desperate late leveller. Eustace made two enforced changes for the trip to Pride Park from the side that lost to Blackburn Rovers three days earlier, with Geoff Cameron and Nahki Wells coming in for Joel Lynch (hamstring) and Jordan Cousins (ankle). The Rams headed into this game aiming to close the gap on the playoff places. Prior to kick off they occupied eighth spot and were just three points adrift. With games running out, however, only victory would do for the hosts. QPR, meanwhile, were looking to finally end any lingering chance of slipping out of the Championship. As the game got underway, they were eight points clear with three games remaining. Owing to a growing injury list, particularly in defence, Eustace was forced to shuffle his pack for the game against a club where he enjoyed two years as a player. Joe Lumley started between the posts behind a back four, from left to right, of Ryan Manning, Cameron, Darnell Furlong and Pawel Wszolek. Luke Freeman was on the left wing, with Bright Osayi-Samuel on the right, while Mass Luongo partnered Josh Scowen in the centre of the pitch. Wells joined Tomer Hemed in attack. The hosts had the first opportunity of the afternoon in the fifth minute when Harry Wilson’s low free-kick from the right was deflected goalwards in a crowded penalty area but Lumley was alert enough to save well. The R’s quickly broke through Wells, who played Manning in down the left but his low centre from the byline was gathered at the second attempt by Rams keeper Kelle Roos. In the eighth minute, Wells had a great chance to open the scoring for the R’s when Scowen went on an excellent run through the middle of the park before a perfectly-weighted pass for Wells, but the Rangers front man saw his drive well stopped by Roos. From the resultant corner, Furlong flashed a header wide as the visitors started strongly. As the half wore on, QPR were enjoying decent periods of possession in the Derby half and on 23 minutes Freeman tried his luck but his effort was wide of the post. And on 34 minutes he had another go following good work from Hemed. Freeman’s effort again flashed wide, but on this occasion had Roos scrambling across his goal. 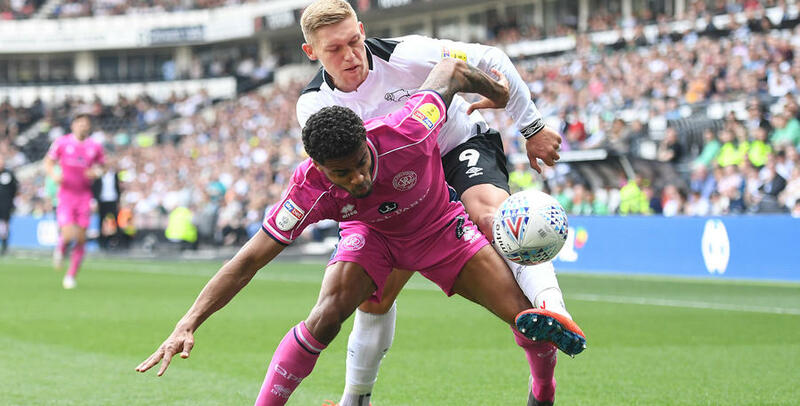 Wilson had a shot from distance comfortably saved by Lumley as the half drew to a close, while he was also the source of Derby’s first effort after the break, this time his vicious free-kick from distance was parried to safety. The hosts certainly had a greater urgency in the second period and Rangers had to withstand a period of pressure. Mason Mount was next to go close, but he cloud only steer his shot wide of the far post while at the other end, Osayi-Samuel broke down the right and played the ball across the face of goal but it was inches too far in front of Hemed, who couldn’t apply the vital touch as he lunged from close range. On 68 minutes, Wilson’s freekick from the right was tipped over by Lumley as QPR battled to keep Derby at bay. And a minute Lumley tipped Mount’s half-volley onto the post when he was put clean through. It was certainly a never period for the visitors. Eustace made his first change of the afternoon moments later as he replaced Hemed with Matt Smith, and this was soon followed by the arrival of Ebere Eze at the expense of Osayi-Samuel. On 82 minutes, Wsolek advanced down the right and picked out Smith but his header looped over the crossbar. 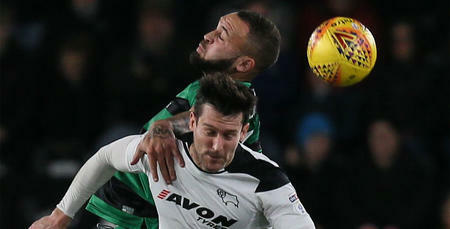 The Rams went more direct in the closing stages as they committed bodies forward, while bringing in the experienced David Nugent as they searched for a late winner. Incredibly, there were NINE minutes of added time at the end to the amazement of Eustace and the QPR bench. In that time, Smith flashed a header inches wide following a great ball from Freeman and it was certainly a frantic end to the fixture. Incredibly, in the 93rd minute referee David Webb awarded a spot kick as he adjudged Freeman to have felled Jayden Bogle in the box. Replays showed Freeman had got to the ball in front of the Derby man and toe-poked the ball away for a corner. But the injury-time penalty curse which seems to have been the story of QPR’s season since the turn of the year returned and Wilson made no mistake from 12 yards to give the hosts the win. And in the final seconds, Wilson grabbed a second as he raced clear before slotting home. It was cruel on the R’s who had battled so well but were left with nothing to show for their efforts.